As you can see I have been incredibly spoiled. Again! I love all of Orla's designs, although this is my favorite. Even the box is much coveted. 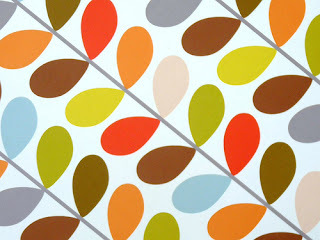 This is very large scale print called Multi-Stem. Believe it or not, this cover is going to make at least two unique quilt backings. I have my rotary cutter poised to cut, without hesitation. Enjoy Sunday - enjoy Mother's Day. Happy Mother's Day! I can't believe you're cutting into that! Love It. I am not as adventurous as you and would have difficulty cutting a perfectly good duvet cover. Great way to think outside the box!! Cut away!! Can't wait to see what quilts get those yummy backs! Happy Mothers' Day, Rita ! That is a beautiful fabric.......what is the content? ohh i love this print!! enjoy your mother's day!! I LOVE that fabric! Have fun with it! You're a lucky girl getting such a beautiful present......looking forward to seeing what you do with it. EEeeeek! Beautiful! Have you got tips for quilting through high thread counts? I'm currently trying to quilt through a sheet backing given to me by a neighbour (on a domestic machine) and I'm having a heck of time with shredding thread (Mettler quilting weight). A topstich 100/14 needle seems to be the best, but I'm not super thrilled with the results. these are stunning...i love the pattern and the color...well everything about it really. Hope you're going to at least keep the quilts for yourself :) Enjoy your day! I hope your Mother's Day was a happy one!!! I hope your Mother's Day was happy. That's a great idea! Happy Mother's Day! Fabulous idea! I'm looking for the perfect retro fabric for some curtains in our new nursery...I might cut one of these covers up myself! cute! I am SO in favor of cutting up bed linens to make quilt backs. I found some great vintage sheets at a thrift store that are destined to become the back of one or more quilts. I even saw a sheet recently in a local discount store that would make a great backing and binding. I may have to go back and buy it. oh my goodness, i adore this!! i'd cut it too, or put it on my bed. lovely, simply lovely! hope you had a wonderful monther's day!! How does Orla do that thing with colour? Jaw on floor. 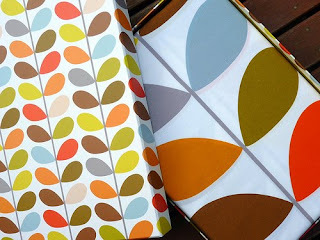 Hi Rita, I saw this fabric on Spoonflower - isn't it very similar to the Orla Kiely? and I have that Orla Kiely quilt set too - I won't be cutting it up though as I'm not as adventurous as you Rita - I look forward to seeing what magic you weave with it.